AlleyOOP DoubleBounce trampolines are built to last. If you’re searching for a highly-rated trampoline that’s safe and study, this brand may be for you. The AlleyOOP DoubleBounce is 14’ in diameter, and the top jumping mat is 40” tall. The taller jumping mat allows for 10″ springs, which give you a deeper, more shock-absorbent landing and excellent return bounce. The maximum single-user weight limit is 250 lbs. Though we don’t recommend more than one bouncer at a time, real world testing for the AlleyOOP is rated to have a combined weight limit of over 800 lbs. JumpSport makes the AlleyOOP DoubleBounce. They pride themselves on patented safety features, quality materials, long warranties and positive customer reviews. In fact, JumpSport’s founder invented the first commercially successful safety net for trampolines, so safety is a high priority for all their products. All trampolines from JumpSport meet or exceed federal standards and exceed the voluntary ASTM Impact Performance Test Standard. With the higher price tag, AlleyOOP DoubleBounce trampolines have a higher level of safety. All their safety nets are top rated. The net on this particular model is rated at 295 lbs. Additionally, it has a patented “Unforgettable” overlapping doorway system, so you don’t have to worry about bouncers forgetting to zip the net and accidentally falling off. The AlleyOOP Double Bounce Trampoline has a unique double-mat system. Not only does it give you a bigger bounce, it reduces the risk of injury. There is also a safer pad space for jumpers to rest (and ensure that only one person is bouncing!). You’ll receive the trampoline and enclosure with your purchase. The ladder and all other accessories are sold separately. Only one customer noted defective t-post leg pieces. However, JumpSport’s customer service team overnighted the replacement parts at no cost. Overall, there are no major complaints about the shipment of this trampoline. Owners rave about the safety of this product and how sturdy it is. They especially like the entrance and safety net. One customer mentioned that it held him and prevented an injury. Adults even feel comfortable jumping on this trampoline and feel safe knowing that it’ll hold a heavier weight. The AlleyOOP Double Bounce is a premier product. One owner mentioned they purchased the product in 2004, and that their five kids have used it year-round since then. They are so confident in the quality that they say their younger kids will continue using it for the next 6 years while they’re still living at home! Most owners say the assembly process was straightforward and easy. A few customers say the instructions and video could have been better. Overall, most reported they could set up the trampoline within 2-5 hours. 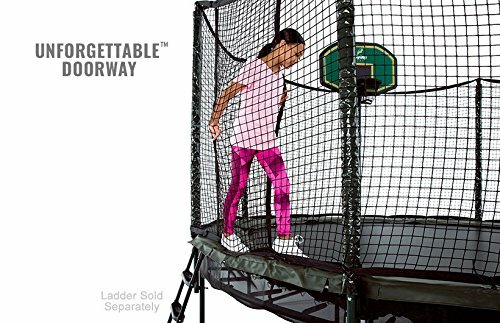 The standard price tag for the AlleyOOP DoubleBounce is $2099 plus free shipping, as of the date of this review. JumpSport offers coupons and promo codes often if you sign up for their mailing list. AlleyOOP DoubleBounce Trampolines are available at JumpSport and Amazon. JumpSport.com provides a list of local retailers if you prefer to buy this trampoline from your local store. Some of these retailers offer promotions, such as a free ladder or other accessory, when you buy the trampoline from them. You can purchase a variety of replacement parts directly from JumpSport’s website. 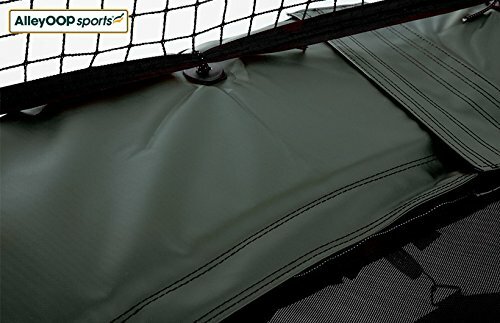 While the AlleyOOP is built to withstand extreme temperatures in all climates, JumpSport recommends using their 14ft weather cover to prevent early decomposition of the mat. They also recommend that owners turn sprinkler heads away from the underside of the trampoline frame. The AlleyOOP DoubleBounce is an investment for your family. Though it is one of the higher-priced options, you can be assured that you’re purchasing one of the safest, highest-quality trampolines on the market. If you plan to keep your trampoline for years to come, the AlleyOOP is one of the best options.